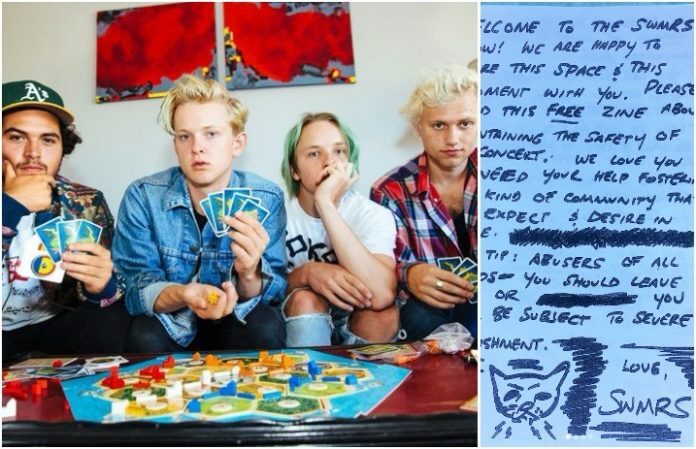 We already knew SWMRS were a cool band, and their newest project proves that to be the case. The band have released a zine that they’ll be giving away at the rest of their shows about how to maintain safety at the concert. “Pro tip: Abusers of all kinds—you should leave now or you will be subject to severe punishment,” the band write. And we love it. The zine features tips for fans, with the important reminder that sexual assault and harassment is NOT NORMAL or okay at shows—or anywhere. They also included a letter from the perspective of a femme who works at venues and grew up in the punk scene, and she points out some of the struggles she dealt with—noting, most importantly, that she wants other women to feel comfortable to speak out when they feel uncomfortable. Not to mention, SWMRS share resources for those who feel unsafe at their show (“we will stop our set to stop abuse”) along with other resources anyone may need. See the zine, which you can pick up on their co-headlining tour with the Interrupters, below. Plus, check out the list of forthcoming tour dates below. What do you think of SWMRS’ stellar zine? Let us know in the comments below!